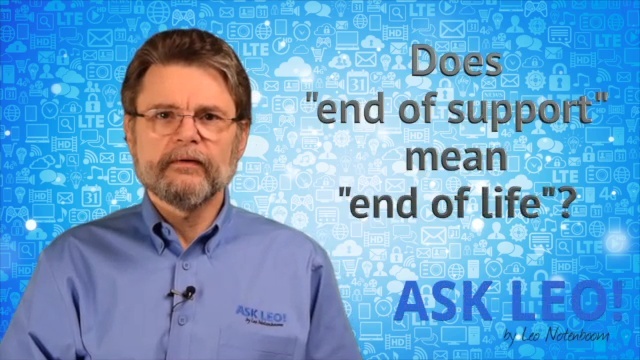 Continue Reading: Does "end of support" mean "end of life"? I've lost my Windows 7 installation disk, but I possess the product key. What should I do if I want to reinstall Windows on my computer? Can I download Windows somewhere? First: take a full system-image backup as soon as possible, and use that as a fallback. You can always restore to that image in lieu of a reinstall, and you'll be back to where you were at the time the backup was taken. You could also get in touch with the vendor who sold you the computer. They provided you with a copy once; perhaps they'll be willing to get you a replacement copy. You could, I suppose, go buy a new copy. Most people aren't interested in doing that, because they don't want to pay for something they feel they've already purchased. That's when most people resort to finding a place from which to download Windows. Depending on the version of Windows and where you find it, it might even be legal. Continue Reading: Where can I download Windows? Can you show me how to burn ISO files? I downloaded this game and it arrived as an .ISO file. Windows keeps saying that it doesn't know how to open it. Someone told me that I need to burn it to a disc. How do I do that? The ISO format is a popular way to distribute large packages of files that would normally appear on a CD or DVD. The reason is simple: an ISO file is typically a bit-for-bit image of a CD or DVD. There are several ways to get at the contents of an ISO file. The most common way is to burn the ISO's content to an actual disc. Continue Reading: How do I burn ISO files? In a corporate VPN, machines use the internet to securely connect to the private corporate network. All traffic that travels on the public internet is encrypted in such a way that it is only meaningful to the VPN's corporate entry-point, where it joins the corporate network. Exactly. Disabling SSID broadcasting is an attempt at security by obscurity but fails miserably because it doesn't actually create any obscurity. In fact, the contrary is true: disabling broadcasting makes a network more visible, not less visible. In the real world, wireless hacking is actually quite rare. If you protect your network in even the most rudimentary way - WEP and a very weak password - it'll likely not be hacked. And if you protect it with WPA2 and a strong password, the chance of it being hacked is so close to zero that other measures - such as MAC filtering or disabling SSID broadcasting (which is a snake oil fix anyway) - are completely redundant. If a company uses a Hotmail, gmail, aol/aim or any other free email services, I always consider it as spam. Yes I will judge a business by the email address they use. I know some may be a legitimate business, as I have learned 90% will be spam/scams. A custom email address makes a business look a lot more professional and will be taken serious. As for a nonbusiness personal email address free email services is fine in my opinion. I use gmail and Hotmail, I had a yahoo address years ago, I deleted it the day after I made it I just didn't like it. Back in 2007 to 2009 I was a tournament host for a gaming site, I had a aim address i used only for hosting reasons. I haven't used or logged on to aim since 2009, I did delete all contacts before I abandoned it. Sometimes the webmail interface is so awful that they don't want to use it. I have friends with their business who found the webmail service provided too difficult to use. I put Thunderbird onto their machines to give them a decent interface. Plus it provides a back up of their emails. Unknown by the prospective customers, enquiries from their website go to a Gmail account to filter the spam, and they are automatically forwarded to their domain address. Any replies they send out, come from their domain address. What most people don't realize is that all my email - personal and Ask Leo! - on all my most used domains - is run through a couple of Gmail accounts. I readily admit to being a Win10 opponent. Every fiber in me rebels at the lack of choice and transparency MS offers with it. Since they started pushing it, I have been carefully vetting Windows Updates as they come down the pipeline to avoid installing anything pertaining to Win10. So I was delighted to find GWX Control Panel. I have had it installed for a few weeks now, set to "Monitor" mode, and have experienced no problems. I'm confident now that my computer is "clean". GWX Control Panel provides options for accepting Win10 files also, so if you do decide to go for it, it's easy to do. To succeed in business add value to the world. I outline the tools, and the philosophy, behind the approach that I'll be taking to lead you to online success. Read: You Need a Website. Yes, You.